Sources for Information on the Iranian "Threat"
Besides being an important issue in itself, the current hysteria about Iranian nuclear weapons provides an amazingly-clear opportunity to understand the natureand powerof the Propaganda system in which we are increasingly enmeshed. For that reason I decided to spend three weeks doing some in-depth research for the purpose of checking all of my own ideas and assumptions about these goings-on. Despite the fact that I think about this stuff all the time, even I was surprised at the depth of deception and distortion on the issue of Iran. Have we all lost our minds? No, but we have all been conditioned to be afraidbe very afraid!and to justify our fears in ways that fit with the needs of those who would "protect" us. It's hardly a new phenomenon, but it's worth spending some time to understand how this works, as it is this type of manipulation of genuine emotion that leads us into wars over and over again. So, this week I talk about Iran, then next week I'll talk about the broader Middle East, and finally I hope to talk about nuclear weapons and Great Power politics around the world. I hope to show that it's possible for a regular person to break out of the one-dimensional world of Propaganda and begin to see the world as the complex and ever-changing place that it is. My hope is that the journey will lead us away from fear and help us think more clearly about what we can do to change the world in life-enhancing ways. Ambitious? Sure! Let's get to it. Here's scholar Juan Cole in the October 1st Salon called "The Top Ten Things You Didn't Know about Iran." "Isn't the Iranian regime irrational and crazed, so that a doctrine of mutually assured destruction just would not work with them? "Reality: Iranian politicians are rational actors. If they were madmen, why haven't they invaded any of their neighbors? Saddam Hussein of Iraq invaded both Iran and Kuwait. Israel invaded its neighbors more than once. In contrast, Iran has not started any wars. Demonizing people by calling them unbalanced is an old propaganda trick. The U.S. elite was once unalterably opposed to China having nuclear science because they believed the Chinese are intrinsically irrational. This kind of talk is a form of racism." Sometimes I wish Nygaard Notes were illustrated. I'm wishing it right now, since this issue offers some thoughts about the current hysteria about Iranian nuclear weapons, and the effort to sort through the issue best begins with a look at a map of the region. (For those of you reading Nygaard Notes online, or in email form, here's a map to look at. There are eight nations in the world known to possess nuclear weapons. All of them are close to Iran, either literally close or close in the imperial sense. Five of themChina, France, Russia, England, and the United Statesare officially a part of the Nuclear Nonproliferation Treaty, or NPT, described as "the cornerstone of the global nonproliferation regime." Three statesIndia, Israel, and Pakistanalso have nuclear weapons, although none have joined the NPT. Israel "does not admit to or deny having nuclear weapons," according to the Arms Control Association, but everyone knows they have them. Maybe 200 or 300, no one seems to know for sure. 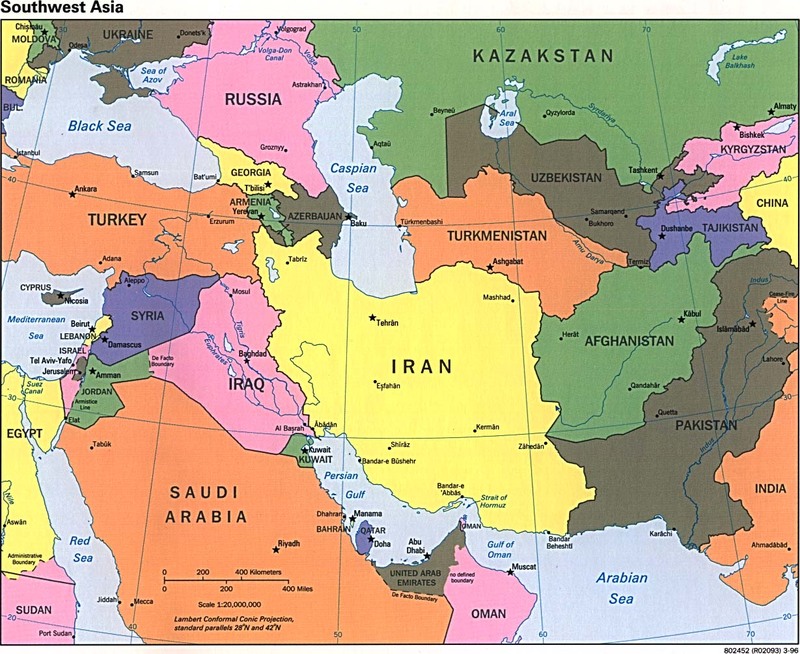 Now look at, or picture, our map of Iran. Imagine being an Iranian, and looking around to see from which direction a threat to your nationnuclear or otherwisemight come. What would you see? Immediately to the east of Iran is Iraq, effectively under U.S. control (this is what I meant when I referred to being close in the imperial sense). U.S. covert activities aimed at destabilizing other countries are often based in U.S. embassies, and the U.S. has built "the biggest, most expensive embassy ever" in Iraq, according to the Christian Science Monitor. The NY Times reported on October 8th that "The Americans hope that by next spring, they will be operating from ... 6 supersize bases and 13 smaller ones" in Iraq. Immediately to the west of Iran are Afghanistan and Pakistan. Pakistan is a major, if erratic, U.S. ally, and has its own unregulated and unsupervised nuclear arsenal. Afghanistan, like Iraq to the east, is functioning as a staging area for U.S. imperial activities, even if it's not totally under U.S. control. While the Obama administration officially debates what to do, "The CIA is deploying teams of spies, analysts and paramilitary operatives to Afghanistan, part of a broad intelligence surge' that will make the agency's station there among the largest in CIA history, U.S. officials say." That's according to the Los Angeles Times of September 20th. So "the largest embassy ever" lies immediately to the west of Iran, and one of the largest CIA stations in history lies immediately to the east. So the means are there to back up the repeated U.S. threats against Iranthe U.S. has said repeatedly that "no option is off the table," the accepted code for a military threat. In addition, the Middle East's only nuclear state, Israel, is not shy about threatening Iran. A fairly typical headline appeared recently on CBS News, reading "Israel Prodding U.S. To Attack Iran." And the Associated Press reported on July 5th that "Vice President Joe Biden signaled that the Obama administration would not stand in the way if Israel chose to attack Iran's nuclear facilities." Beyond the countries it is occupying, the U.S. maintains additional military facilities all around Iran. Not only in Iraq and Afghanistan, but also in Turkey, another country that borders Iran. A number of U.S. military bases (half a dozen, perhaps) are maintained just across the Persian Gulf in Saudi Arabia and the United Arab Emiratesa distance of 100-200 miles from Iran. Again, refer to our map. I would be remiss if I did not mention in this context the massive U.S. military base in the Indian Ocean island of Diego Garcia, which GlobalSecurity.org's John Pike refers to as "the single most important military facility [that the U.S. has] got." The base, used for secret detentions and torture as well as a launching pad for attacks on Iraq and Afghanistan, is named "Camp Justice." Iran is well within range of the U.S. bombers based at "Camp Justice." In the world of Empire, illegal detentions and torture are transformed into Justice. But that's not all that gets inverted in reporting on the maintenance of the U.S. Empire. On September 28th Iran announced that it had test-fired some missiles, saying that "Iranian missiles are able to target any place that threatens Iran." The Associated Press report on this event bore the headline, "Iran Tests Advanced Missiles, Raising More Concern." The "concern" arises in part, according to the AP, from the fact that "U.S. military bases in the Middle East" would now be "within striking distance" of Iranian missiles. In this Upside-Down World, defense thus becomes offense. Consider: The World's Only Superpower maintains military bases around the world (more than 700 of them! ), including in two countries that it is currently occupying. This Superpower possesses approximately 10,000 nuclear weapons, remains the only country that has ever actually used such weapons, and also happens to be the country that overthrew the democratically-elected government of Iran in 1953. The country that lies in between the two U.S.-occupied countries, and which is surrounded by U.S. military bases, is thought to be attempting to acquire the capacity to attack the bases of the Superpower that lie near its borders. Yet the global reach and bloody history of the Superpower in the region is not what "raises concern." What "raises concern" is the possibility that the weaker state may be developing the capacity to defend itself. Iran has not launched an aggressive war in modern history. The pattern repeats itself in the media endlessly. As in a story that ran over the UPI wire service on July 25. The lead paragraph was accurate, saying "Iran would bomb Israel's nuclear facilities if Israel were to attack Iran, the head of the Revolutionary Guard said Saturday." Sounds like self-defense, right? But here's the headline: "Iranian General Threatens Israeli Nukes." Iran is well aware of the fact that the most recent victim of U.S. military attack and occupation was Iraq, a weak state that seemed to have little capacity to defend itself, while North Korea, which has tested nuclear devices and has weapons-grade materials and has tested its own missiles, was left alone. Since 1979 Iran has been portrayed in this country as an enemy of the United States, and in recent months the news is filled with talk of the "Iranian threat." But Iran was a big ally of the U.S. before 1979. According to University of Virginia professor emeritus R.K. Ramazani, "the United States itself actually relied primarily on Iran to perform the role of the policeman' for the Gulf region" until the Iranian revolution. So we can see that there is nothing inherently "anti-U.S." about Iran. Dr. Subhash Kapila, a scholar writing in a 2006 paper for the South Asia Analysis Group, states bluntly that "Iran with or without nuclear weapons can never match American military predominance." This point is supported by everything I've been saying about U.S. military strength in the region. Kapila adds that "The main strategic impulse that formulates US threat perceptions arising from Iran is the emergence of Iran as a regional power in the Gulf Region' and its consequent effects on US national interests in the region." His point is reinforced by the words of John Negroponte, speaking before the Senate Intelligence Committee when he was the Director of National Intelligence back in 2006. He said that "Iranian conventional military power constitutes . . . a challenge to US interests. Iran is enhancing its ability to project its military power in order to threaten to disrupt the operations and reinforcement of US forces based in the regionpotentially intimidating regional allies into withholding support for US policy toward Iranand raising the costs of our regional presence for us and our allies. "Tehran also continues to support a number of terrorist groups, viewing this capability as a critical regime safeguard by deterring US and Israeli attacks, distracting and weakening Israel, and enhancing Iran's regional influence through intimidation. Lebanese Hizballah is Iran's main terrorist ally, whichalthough focused on its agenda in Lebanon and supporting anti-Israeli Palestinian terroristshas a worldwide support network and is capable of attacks against US interests if it feels its Iranian patron is threatened." Note that the "threat" posed by Iran takes two forms. One is the capacity to challenge "U.S. interests." The other is the ability to "deter US and Israeli attacks." That is, to defend itself. Still another reason that it's unlikely that U.S. planners are worried about Iranian nukes is that Iranian leaders have spoken of a religious prohibition against nuclear weapons. A statement by the Iranian government to the International Atomic Energy Agency on August 10th 2005 stated this: "The Leader of the Islamic Republic of Iran, Ayatollah Ali Khamenei has issued the Fatwa that the production, stockpiling and use of nuclear weapons are forbidden under Islam and that Iran shall never acquire these weapons." Everything I've read indicates that Khamenei is the real power in Iran, despite the fact that President Ahmedinejad gets all the headlines in this country. It appears to me that the most rabid disseminators of fear of Iran base their propaganda, in part, on the alleged religious fanaticism of Iran's leadership. Wouldn't Khamenei's fatwa seem convincing proof to such people that Iran is not a threat to use nuclear weapons? If the above points are true, then all the hysteria about Iran in this country must be motivated by something other than a supposed nuclear threat posed by Iran. The workings of the U.S. Propaganda system in regard to the volatile region that we call the Middle East works in our minds to create a very bizarre world that is often upside-down and backwards. In the next issue of the Notes I'll talk about that system and how one state without nuclear weapons can be seen as a "rogue state" while another state that actually has a secret, unregulated nuclear arsenal is not. A good place to start is "The Top Ten Things You Didn't Know about Iran," by scholar Juan Cole. To help break out of fearful thinking and move toward strategic thinking, I recommend a short (2,000-word) essay from 2006 by Dr. Subhash Kapila called "United States-Iran Confrontation: The Strategic Impulses" It's on the website of the South Asia Analysis Group, found here. Former U.N. weapons inspector Scott Ritter has three recent comments worth checking out. The first one appeared in the London Guardian. Click here and search for "Keeping Iran Honest." Find an audio interview here. Finally, there's a Ritter video interview; go here and search for "Ritter." Despite what you have undoubtedly heard, the Iranian president has never said that "Israel must be wiped off the map," or "wiped out." The best clarification of this endlessly-repeated falsehood can be found on the site of the Mossadegh Project, in a 2007 article by Arash Norouzi called "Wiped Off The Map'  The Rumor of the Century."